The authors’ perspective on "moral injury" is valid. My added perspective is that physicians are very well trained in NEGATIVE resilience and poorly trained in POSITIVE resilience. There are so many viewpoints on this topic, and I believe the vast majority are truthful. Certainly, the article’s popularity confirms that the concept of burnout may not resonate with many physicians. There are so many health conditions that have been described with different names or terminology. As physicians, discussing mental and emotional issues with patients comes naturally to us. Turning the lens on ourselves and our colleagues is more difficult. Our lack of self-awareness, our competitive nature, and our negative perception of the word burnout could all explain the lack of resonance of “burnout” with physicians. We certainly do not need to be stuck in the old literature, in which Maslach defined burnout as a series of symptoms including emotional exhaustion, depersonalization (or cynicism), and a decreased sense of personal accomplishment. Much has been learned about burnout over the last few decades. If you are interested in a deeper dive, feel free to check out the article Understanding the burnout experience: recent research and its implications for psychiatry by Christina Maslach and Michael Leiter. Burnout is not a failure of resourcefulness or resilience. Moral injury in medicine is described as the failure to consistently meet patient’s needs or to provide high-quality care. It results from highly conflicted allegiances to patients, organizations, and self. While I personally believe that you don’t have to measure everything in medicine in order to manage change, many of those involved in healthcare, including a lot of physicians, want to follow the science. For those, we need to be measuring something and tracking the effectiveness of our interventions. One can attempt to measure resilience, attitude, productivity, and much more. There are many available assessments that can help - such as the Maslach burnout inventory and the Physician Well-Being Index. All of these descriptions of “the problem” are valid. Currently, I am not aware of an assessment tool to measure moral injury, or the number of repetitive cuts that one can endure before healing begins or recovery is no longer possible. If we want to find solutions, what if we moved past which words are better? Resilience? Burnout? Well-being? Moral injury? I am passionate about working on them all, for “I do what I do to make a major positive impact on other people’s lives.” I am willing to measure subjectively, rather than just objectively. Many in our healthcare system want or demand an objective measure. Without an objective measure of moral injury, we may need to continue to measure burnout or well-being. I commend the authors for a very well-written article. 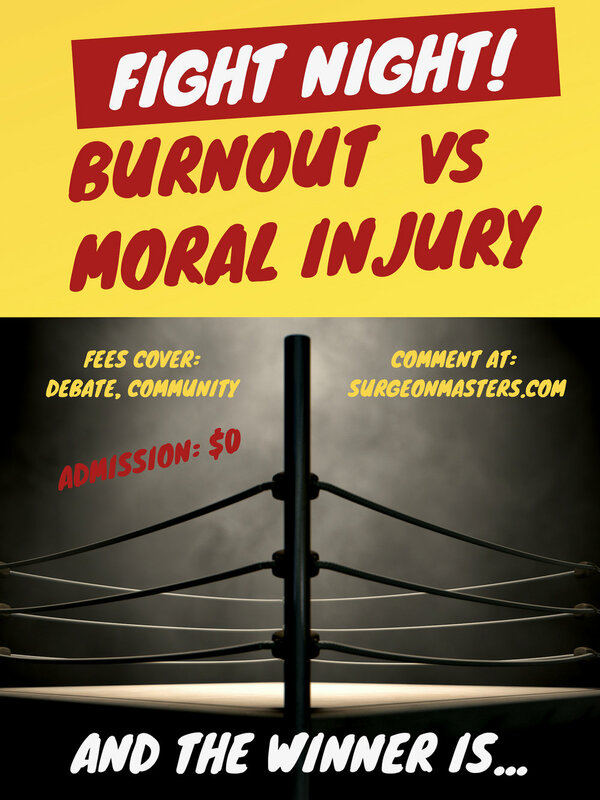 When the system is burning out or morally injuring surgeons, physicians, and many others in healthcare, who is the winner? Let’s change the system in many ways and keep supporting each other as we do it together. SurgeonMasters is building a community of surgeons and physicians focused on changing the practice of medicine. Email Team@surgeonmasters.com to contribute your voice to the conversation. Source - Physicians aren’t ‘burning out.’ They’re suffering from moral injury, By SIMON G. TALBOT and WENDY DEAN, JULY 26, 2018.